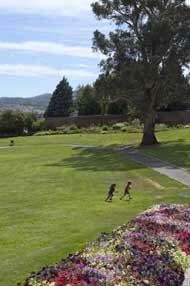 By PATSY HOLLIS | The Royal Tasmanian Botanical Garden in Hobart stretch serenely from the Domain within view of the sandstone turrets of Government House almost down to the river. Known as the most beautiful of all botanic gardens in Australia, they were established by Governor Sorell in 1818 on land granted to a former convict to run a farm. Their history, however, was not always serene. 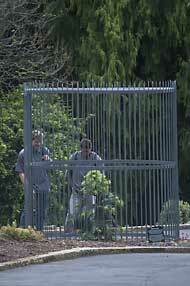 Some people, working hard to scratch a living in the fledgling settlement, didn't think convicts should be assigned to the gardens when they could be helping them. So that the next governor, George Arthur, was led to declare himself “disgusted” at the lack of permanent staff and ordered four convicts to work there for a few hours each day. 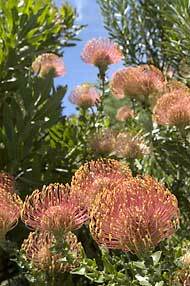 Governor Arthur wrote: "It was my wish that a Botanical Garden be proceeded with in the Domain ... to collect the Plants, shrubs, etc, with which the colony abounds. It is discreditable not to stir in this and I am anxious about it as I find it remarked by strangers." The first superintendent, William Davidson, lived in the sandstone cottage that is now the Museum at the gardens. A capable, experienced chap, for "a salary of 100 pounds with a ration and a house to live" he built fences, installed mushroom beds, went to the army for manure and grappled with bureaucracy for supplies. But the grumbles rumbled on. There were letters in newspapers complaining about "the excessive number of convicts employed there". People criticised the garden's fruit and vegetable patches, a perk as they saw it for government officials — while light-fingered people decided to help themselves. Funding for the gardens, too, varied wildly year to year and rarely seemed to be enough. "There are many fine specimens of native plants but few, if any, had their names attached...plants commonly cultivated in England were conspicuously named." For all this, the gardens became so popular they had to be closed on Sundays by order of Governor Arthur, because of "the extreme inconvenience and injury which arises from the great number of persons who resort there on the Sunday" (the one day off in the week). By 1844 the TBG was only open on Wednesdays and Saturdays and the entrance was one shilling. For a shilling an alarming number of rules and regulations had to be complied with. Among them: correct attire to be worn, no musical instruments to be played within the grounds, no whistling allowed, and no smoking. Another stern injunction was that "Seats must not be sat upon in an improper manner". More criticism came from outsiders. Despite the fact that more than 130 species of native plants were planted during William Davidson's time, overseas visitors intrigued by Tasmania's unique vegetation found the TBG (the Royal wasn’t added until 1967) to be too English. One, Frederick Mackie, noted in his journal: "There are many fine specimens of native plants but few, if any, had their names attached…plants commonly cultivated in England were conspicuously named." In 1852, Mrs Charles Meredith in her book My Home in Tasmania wrote "they are English-looking gardens — full of the sweet homely faces and perfumes" but even as late as 1881 Marianne North in her Vision of Eden sniffily referred to them as "far too English". This situation has long since changed and, in addition, a special Tasmanian native plant section was opened in 1991. A ramble through the gardens today reflects none of the foregoing turbulence but there are still interesting reminders of those early days and fine stonework by the convict labourers. 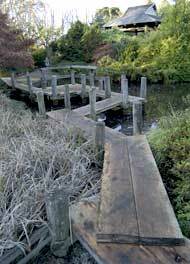 Highlights include the Japanese Garden and Pete's Vegie Patch, but as the philosophy of the Royal Tasmanian Botanical Garden is "to grow as many varieties of plants as weather and the soil will support" many delightful surprises await around every bed and along every path. Most visited is the Japanese Garden.